Google has the two powerful tools that help in getting the information on your fingertips. One is Google Search Engine and other is Google Chrome browser. 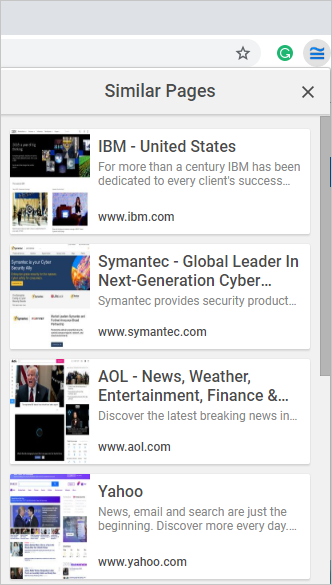 Chrome by default uses Google Search Engine to search the web. However, some users can have different needs and requirements than a simple search and some may simply wanted to have enhanced searching experience. This is why Google Chrome offers multiple extensions related to searching to aid its users. Here are some of the best extensions to make your searching experience better. Privacy is important for every person. This is the reason why a large number of extensions and applications focus on it. Google is a mainstream search engine but it does not handle privacy related concerns itself. This is a downside of using Chrome however there is a solution to handle this. You can tweak the browser settings to gain more privacy. A privacy-concerned extension known as ‘Search Encrypt’ is used if secure browsing is your priority. 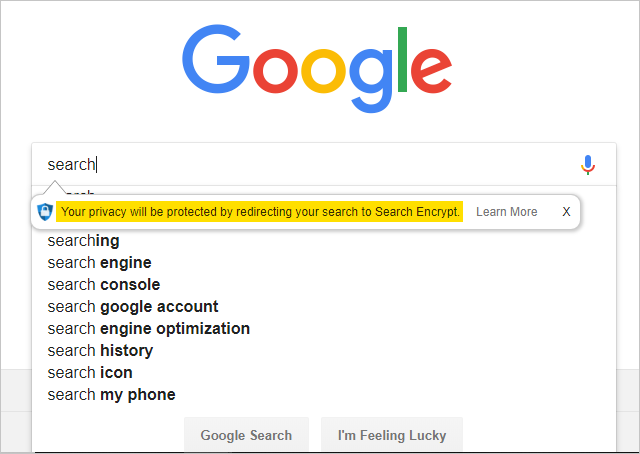 When you install Search Encrypt extension on Chrome, it will change the default search engine to searchencrypt.com. Your search history cannot be tracked by using this extension. Moreover, as soon as the browsing session expires, the browsing history will get deleted. Another advantage of search encrypt is that it effects all types of search engines. If you are using any other search engine, it will redirect you to Search Encrypt’s search engine. However, you can click on the icon of the extension from the menu in order to disable the redirection. Did you ever wish to search a selected piece of text by just a couple of clicks? If yes then ‘Context Menu Search’ is the extension you need. You just have to select the text that you want to search and right click on it. Afterward, use the search functionality of the extension and use any of the given search engines. Some search engines are developed to perform searching for a specific type of data. This is where the major advantage of this extension lies. In order to search a selected text, you can either choose from given search engines or add yourself. In this way, searching can become time efficient as you don’t have to open new tabs every time. How about getting a preview of a website in search results without even opening it? 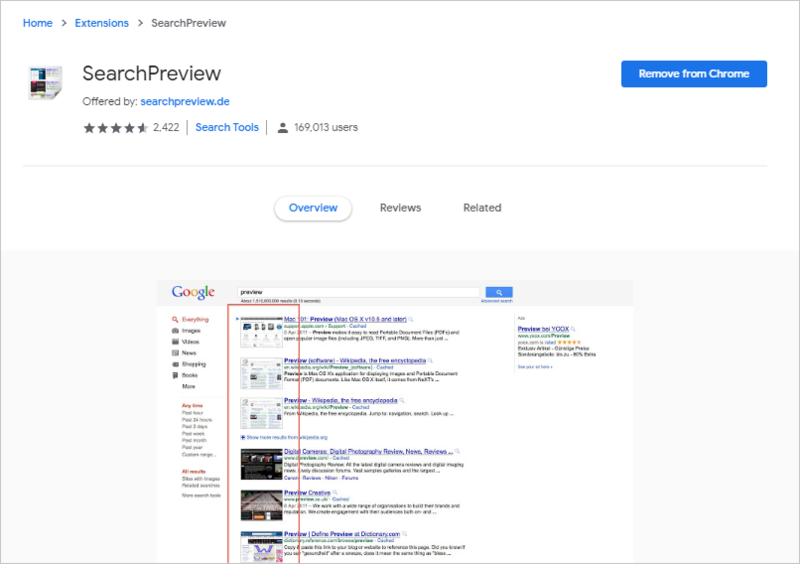 Search Preview extension enhances your search by providing a preview image and popularity of a website. Both of these can come handy when you are looking for the best websites. This extension is compatible with most of the popular search engines including Google, Yahoo! and Bing. You just have to install this extension to Chrome and search anything on a search engine. Afterward, an enhanced version of the search result is shown. The preview images are now displayed with every search result. ‘Google Similar Pages’ is an official extension developed by Google. Sometimes you reach a webpage and want to get similar recommendations like that website. By default, there is no such functionality available in Chrome. However, Google itself offers this extension. In order to get recommendations, open the webpage that you like and click on the extension icon next to Chrome address bar. A list will open showing similar web pages. This extension is quite efficient because suggestions regarding nearly every type of webpages are available. Some websites do not offer search feature of their own even though they have numerous web pages. There could be lot of reasons for this like avoiding search script on each page can improve the page loading speed. However, it will be quite tiresome and time consuming for a user to find a specific piece of content manually on the site. Fortunately, an extension, known as ‘Search the current site’ offers the capability to search anything within a website. The search process is quite simple on this extension. Open the website you want to search detail. Click on the extension icon and type what you want to search. It will redirect you to a webpage on Google where you can view the list of results on the site. Google is the most powerful search engine. However, getting the precise information from billions of relevant webpages is a difficult task. Depending upon the need, you can use one of the above-explained extensions in Chrome. This will help you to get the information you are looking for.